7.1 Should I pool or solo mine? 7.2 What is the difference between a CPU vs. GPU pool? 7.3 How do I know if I'm connecting to a CPU or GPU pool? 7.5 Can I set a miner comment for blocks my pool wins? 8.3 Error: unable to start pool Starting pool failed: the port 8500 is already bound on 127.0.0.1! Current Round: X - the blocks that have been won by this pool. This increments each time the pool wins a new block. 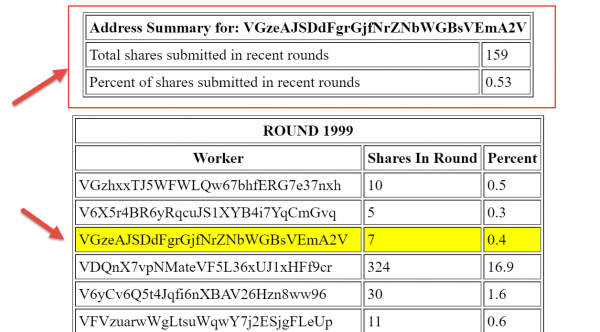 Once a round is won, then the pool payouts the reward from the block proportionally to all the shares submitted. For example, if you mine on a pool for 10 minutes, and it wins a block (block time is targeted for every 30 seconds, other pools may win other blocks in the meantime), and you contributed 10% of the shares to that round, then you will receive approximately 10% of the block reward (less pool fees). 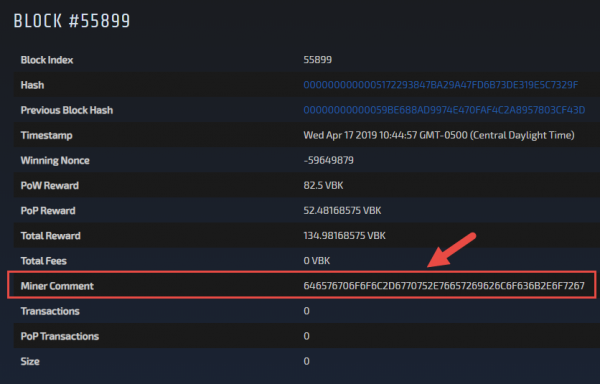 Technical note - The pool data is stored in the file: "\testnet\poolshares-normal.txt". Is that is deleted, then the html page will start anew. #set the address the pool fees are paid out to. # NOTE: This should be different than the pool address that appears on the website. In the NodeCore_CommandLine, run startpool, either for CPU or GPU. Note that one instance of nodecore supports only 1 pool. If you want both a CPU and GPU, then you'll need to run two instances of NodeCore, one for each. Note the Pool Address is created by the pool service, and is separate from the 'pool.operator.address' that the fee is paid to. For better pool stability, set nodecore.properties to auto-restart the pool. 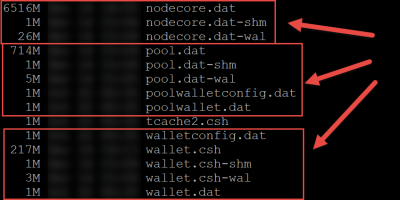 When nodecore starts (or restarts), it will automatically start the pool without needing to run the NC_CLI startpool command. "pool_html_file.txt" is relative to the bin folder. This takes the contents of the file and injects it directly into the top of the pool html page as an html snippet. Modify nodecore or nodecore.bat to allow Java to use more memory instead of the default 6. Consider 16g, 24g, or 32g depending on your pool size. # Add default JVM options here. You can also use JAVA_OPTS and NODECORE_OPTS to pass JVM options to this script. The log level can be changed: HowTo_run_NodeCore#How_to_set_NodeCore_log_level. A high level (default) provides more detail in case something went wrong, but takes more resources. echo ": NodeCore is restarting in 30 seconds! :"
echo ": Press CTRL+C to cancel this or ENTER to proceed immediately...     :"
There will be two addresses: (1) the pool address (on the pool html page), (2) the pool owner's address that any fees are sent to. "timestamp": "Oct 1, 2018 6:01:33 PM"
This is available with NodeCore 0.4.2-rc.3 and greater. There is a beta for FGPA pools. This is being shared on Discord (https://discord.gg/wJZEjry). This is run just like a normal pool, except set the type to "FPGA" instead of "GPU". Should I pool or solo mine? Joining a pool reduces the variance. If you join a pool, you are more likely to get a trickle of rewards because the pool has higher hashing rate, but splits among all the members. Pools will also have an operator fee, but that is negligible. If you solo mine, when (if) you do a get a reward then you get the whole thing. If you solo mine at 1/10000 of the total network hash, statistically within 10000 blocks you will win a block and get the whole reward. There is not a right or wrong answer to (1) Should I join a pool or solo mine, or (2) should I join a big pool or a small pool. What is the difference between a CPU vs. GPU pool? CPU and GPU should connect to different pools. On a high-end GPU, the GPU miner is roughly 400 times faster than the CPU miner on a high-end CPU. In order to accommodate both types of mining, we have two different modes for the pool software which either accept shares at an appropriate difficulty for CPU miners, or an appropriate difficulty for GPU miners. Solo pools do not have to do this, because they can simply allow shares at any difficulty to be submitted, as the number of shares submitted by a particular miner is not relevant to payouts (since all payouts go to one address). The pool software when running in GPU mode will accept shares that represent roughly 4.26 GH of mining, and in CPU mode will accept shares that represent roughly 16.7 MH of mining. If mining on a public pool (a pool where other people are also mining), please ensure that the pool is running in the appropriate mode for your miner. How do I know if I'm connecting to a CPU or GPU pool? NodeCore pool should clearly tell. If it does not, ask the pool operator to upgrade NodeCore. GPU pool should say "GPU". As of 0.3.11, NodeCore allows the ability to inject an HTML snippet into the pool html page. In the nodecore.properties file, set the 'pool.custom.html=your-html-file-name.html'. This file will be injected into the top of the pool. This requires restarting the whole NodeCore instance to first take affect. But once the nodecore.prop file is set, the content will be auto-picked up by the pool with each page refresh. Can I set a miner comment for blocks my pool wins? Ensure that the nodecore.properties file has been updated per above steps (and NodeCore was restarted). Error: unable to start pool Starting pool failed: the port 8500 is already bound on 127.0.0.1! Ensure that the nodecore.properties file is updated per above, and restart nodecore. Unable to start HTTP server! In an admin cmd window, run "netstat -a -b"
Is there a miner connecting to it? If you run NC_CLI getinfo, does it show the latest block (i.e. does NodeCore appear to be updating)? This should not happen, but if it does... have the administrator restart nodecore on the server. It only restarts the web page, it does not kick out miners. This page was last edited on 22 April 2019, at 10:09.